So, you want to be a fashion designer? Pune has plenty of institutes and courses in Fashion Design for you to choose from, and even our very own ‘Pune Fashion Week’ that takes place annually. Here are 5 institutes which offer courses in Fashion Design in Pune. INIFD in Kothrud offers online certificate courses, as well as 1/2/3-year Fashion Design Certification courses, and a 2-year Post-Graduate course that, “provides a cutting edge expertise to amateur fashion designers”. As a student/alumni, you will also be introduced to career opportunities, internships, recruitment, and networking – through their placement cell. That’s not all – INIFD also provides celebrity mentorship, and exclusive opportunities to attend international events like the New York Fashion Week and London Fashion Week, and ‘exposure to exhibition participation’ as well. SIFT is a division of Suryadatta Group of Institutes, and currently offers a 3-year BSc in Fashion Design (B.Sc. FD). This course is affiliated to the Yashwantrao Chavan Maharashtra Open University (YCMOU) and is Government-regognised. They also offer a short-term certificate (3-months), advance certificate (6-months) and diploma (1-year) course in Fashion Designing (more info here). Students can avail internship placements for 1-3 months after their course is complete, with help from the Institute, but also depending on the student’s individual performance. MIT-ID is one of the top Design Institutes in India, and offers several Fashion-related courses; like a 4-year intensive Bachelor in Design (B.Des) in Fashion Design or Fashion Communication, as well as a 2-year full time M.Des in Fashion Management and Marketing. The B.Des in Fashion Design is a 4-year full-time, ‘duration intensive professional program’, completed over 8 semesters. You will be living on campus for the duration of your course. As part of the admissions process, you will be required to give a ‘Design Aptitude Test’ (DAT), the results of which will determine your acceptance into MIT-ID. MIT-ID also has their own ‘Industry Relation Department’ for placements, and their own hostel, mess, and recreational facilities for students to live on-campus. SOFT was established in the late ’90s, in collaboration with National Institute of Fashion Technology (NIFT), exclusively for women. They currently offer two categories of learning: one in international collaboration with the Accademia Costume & Moda, Rome; and the other in affiliation with SNDT Women’s University, Mumbai. The former category gives students ‘industry integrated courses with international exposure’ in Fashion Design (3-year), Fashion Brand Design and Technology, and Fashion Buying and Merchandising (both 2-year courses). The latter category offers 4-year Bachelor Design courses in Fashion Design, Fashion Communication, Textile Design, and Jewellery Design. They’re a well-reputed institution, with associations and collaborations in the international fashion world that can take your career far, as well as an illustrious list of ‘star alumni’. SID offers 4-year B.Des (Bachelor in Design) degrees in Fashion Designing, and Fashion Communication. 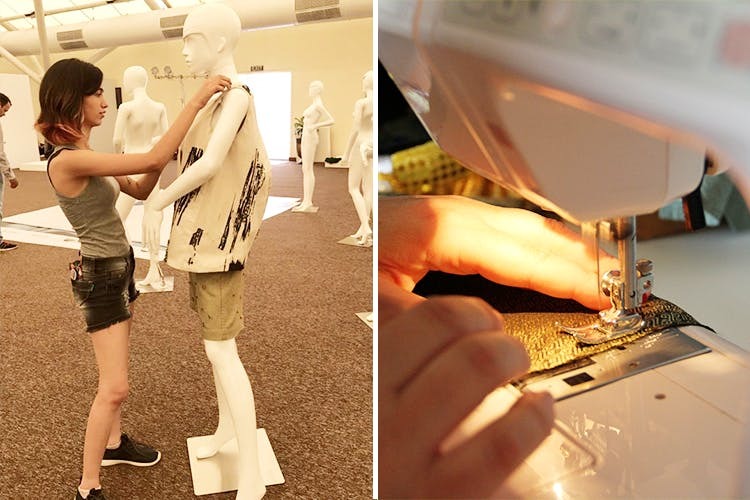 The B.Des in Fashion Design provides students with, ‘a well-rounded knowledge’ of both the Indian and international fashion industry; encompassing design, trends, manufacturing, marketing, and retail. It will equip and build skills, confidence, and the imagination required to take their passion for fashion to new heights. As part of the admission process for Indian students, applicants are required to take the Symbiosis Entrance Exam for Design (SEED) – after which (if you qualify), you will be invited to appear for SID’s Studio Test and Personal Interaction.